Do you love to color and do monthly and weekly readings using the following items? - tarot cards - oracle cards - Lenormend cards - Kipper cards - tea leaves - runes. 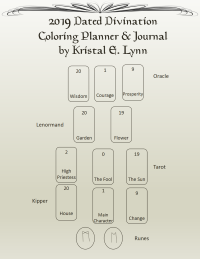 Then this divination coloring planner & journal is for you. It has: - pages for you to do your monthly and weekly readings and journaling - monthly and weekly spreads to help you keep track of what's happening throughout the year - keep track of the moon phases, sunrise and sunset, etc. - fun coloring pages for you to enjoy - blank pages for you to doodle and make notes. There is a dated and undated version available in spiral bound, perfect bound and PDF formats.